This 5th floor apartment offer ample space at almost 800 square feet with its own private balcony. 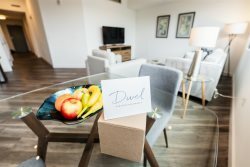 Custom furniture and accessories make this the perfect apartment for corporate business travelers or a couple relocating to the area. Tysons Corner, or simply Tysons, gives its residents and visitors all the conveniences of an urban oasis, without the headaches and complications of a city. Nicknamed America's Next Great City, Tysons is home to dozens of corporations to include Deloitte, PWC, Ernst & Young, KPMG, Hilton Worldwide, SAIC, Gannett and USA Today, Freddie Mac, Kaiser Permanente, and many, many more. World class shopping and dining at both Tysons Corner Center and Tysons Galleria are all within walking distance. Tysons is the place to be in Northern Virginia, and the DC region.